Just curious. How do you folks protect your chisels when they are in a tool box that travels with you? Racks for a shop are one thing, but traveling tool boxes are another. I've managed not to lose the plastic tip protectors that came with the chisels when they were new. Probably not much help to you now. I have the plastic covers for a few, but they don't stay on very well, and I have some chisels I got from a friend who's Dad passed away and they came uncovered. Just curious what other people have come up with. Leather is the traditional way. Low density poly from milk jugs heated (not melted) can be folded and molded to the shape you need, the sheaves are farly durable. Even cardboard (not corgaded paper) will work but not very durable. This is a set of chisels that I bought at an auction. They were protected by the leather sheaths when I bought them and I made the rack for the shop later. When I sold the set, I let the sheaths go with them. My newer set of Irwin chisels came with the plastic protectors and I built a similar rack that allows me to keep the protectors on even in the rack. I generally use those canvas tool rolls. I have a couple I bought from woodcraft that have held up quite well for a decade now. Although I don't travel with them much, I move them in/out of a cabinet frequently. Another option that I have not tried (but will one of these days) is to use Plasti-Dip. I recall reading a thread from Christopher Schwarz about it some time back and got curious. Thanks guys! I just got a leather tool roll from ebay for 6 chisels. Sounds like a pretty high price for a leather tool roll. 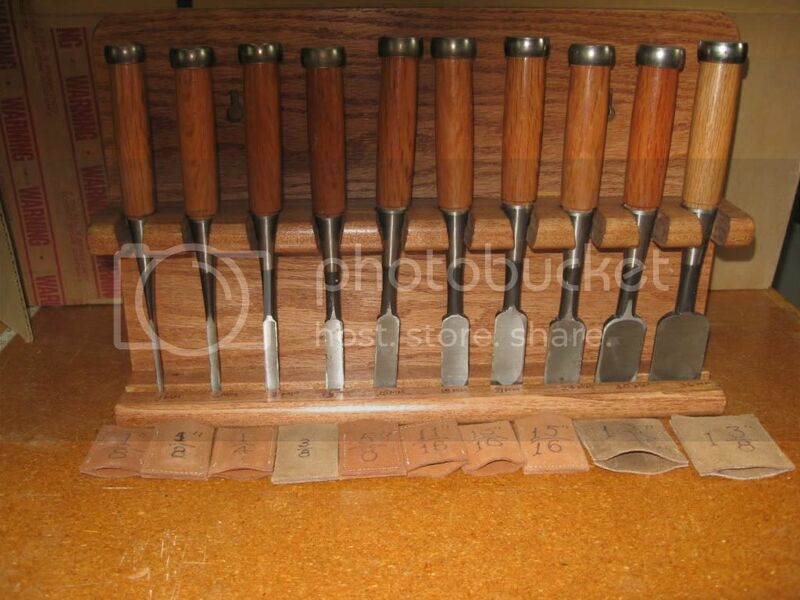 I know that some people have experienced issues with tools stored in leather. It can harbor moisture and it is often cured using Chorium which is caustic to metals. The conventional wisdom is to use "vegetable-tanned" leather to avoid this complication. Additionally, be sure to give them a wipe with some kind of oil or such to aid in preventing rust. Didn't know that, guess I'll give it a try and keep an eye on them as well as a thin coat of oil. Same with bullets kept in belt loops for long periods.